SAP® customers who have long envied the many operational and cost benefts promised by cloud computing can now confdently pursue “cloud-frst” strategies. Companies that have made this move in collaboration with a leading company like Amazon Web Services (AWS) aren’t looking back. 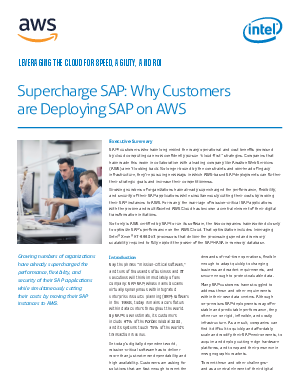 No longer bound by the constraints and overhead of legacy infrastructure, they’re pursuing new ways in which AWS-based SAP deployments can further their strategic goals and increase their competitiveness.